Water damage restoration is an emergency business. That's why ServiceMaster of Calgary is on call 24 hours a day, 7 days a week, 365 days a year. Our quick response reduces your suffering and saves money. If prompt action is not taken to contain the damage, water damage claims increase substantially. At ServiceMaster Restore, we have the labour, equipment and expertise to handle disasters both large and small, from a plumbing leak to large loss situations. Our commercial water damage restoration expertise spans all industries, from retail and hospitality, to healthcare, government and industrial clients. We have also restored thousands of homes as the preferred provider for major insurance companies. Water presents a challenge in its effect on walls, carpets and floors. 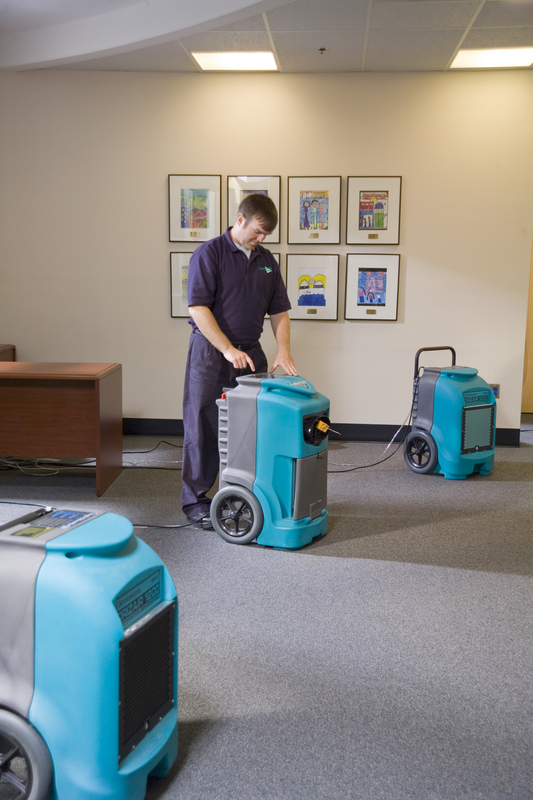 ServiceMaster Clean® understands these issues and provides fast, on-site carpet and wood floor drying. Quick mitigation prevents water damage from worsening, lowers costs and means less stress for you. Waiting to begin water damage restoration services can cause carpet delaminating, more damage to furnishings, mold contamination, extreme water damage to hardwood floors, and odours from absorbed water. Act quickly to being the process of professional drying. It used to be that if your walls got wet, they had to be cut out to ensure thorough drying. That required a process of reconstruction. Not so anymore. Through advanced technical knowledge and techniques like Advanced Structural Drying, building materials can sometimes be left in place while your home or business is being restored. This approach reduces your costs and the disruption to your home or business life. ServiceMaster Restore of Calgary is certified in techniques like Advanced Structural Drying and would be pleased to assist you with your home or business. It is critical you use a provider who is expert at the application of these advanced techniques. Age and condition of carpet. If a carpet is so old that it is a better value to replace than attempt restoration, we"ll let you know what makes the best financial sense. ServiceMaster Clean® uses industry resources to help determine the exact value of carpet. Length of time carpet was exposed to water. Most carpets can withstand water for up to two or three days, but immediate response to your loss is critical. In most cases ServiceMaster of Calgary can be at your site within two to four hours. Type of water. Types of water affect the restoration process. Clean water: Water from a clean source with no debris. Grey water: Water that is not necessarily clean but is not hazardous (washing machine and dishwasher overflow, for example). Black water: Sewage backup or runoff water. These losses are hazardous and should be handled with caution. Water temperature. The temperature of the water is important to consider. For example, a hot water heater with very warm water will affect the glue used to hold carpet fibers together. Wood floors are very sensitive, so proper drying is critical. Wood naturally holds water—up to 10% depending on the type of floor. Wood can absorb another 5% to 10% without showing any noticeable effects. Within a few days, however, floors that cannot hold the water any longer will expand, causing cupping or crowning. Both are very difficult to restore. Emergency response is critical for any damage to wood floors.